The letter is signed by Sens. Cornyn, Inhofe (R-OK), Graham (R-SC), Wicker (R-MS), Vitter (R-LA), Cruz (R-TX), Lee (R-UT), Toomey (R-PA), Rubio (R-FL), Coats (R-IN), R. Johnson (R - WI), Risch (R-ID), Barrasso (R-WY), Coburn (R-OK), Scott (R-SC). Last Thursday, the Senate voted to continue its consideration of your nomination of former Senator Chuck Hagel to serve as our nation's next Secretary of Defense. While we respect Senator Hagel's honorable military service, in the interest of national security, we respectfully request that you withdraw his nomination. 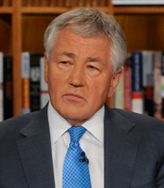 Likewise, Senator Hagel’s performance at his confirmation hearing was deeply concerning, leading to serious doubts about his basic competence to meet the substantial demands of the office. While Senator Hagel's erratic record and myriad conversions on key national security issues are troubling enough, his statements regarding Iran were disconcerting. More than once during the hearing, he proclaimed the legitimacy of the current regime in Tehran, which has violently repressed its own citizens, rigged recent elections, provided material support for terrorism, and denied the Holocaust.